el Javo | This is my story, one day at a time. 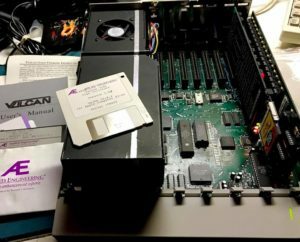 A few months ago i acquired an Apple IIgs, and to my surprise it had a Vulcan drive inside. 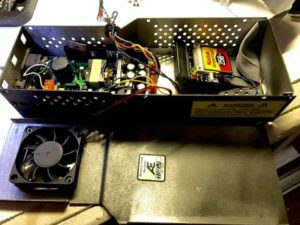 The Vulcan was an internal combo of hard drive/power supply with a controller card. At that time, the only hard drive options were an external drive or an IDE card. The Vulcan was attractive by combining a strong power supply that also housed the hard drive. It was black colored and looked really nice replacing the internal power supply. 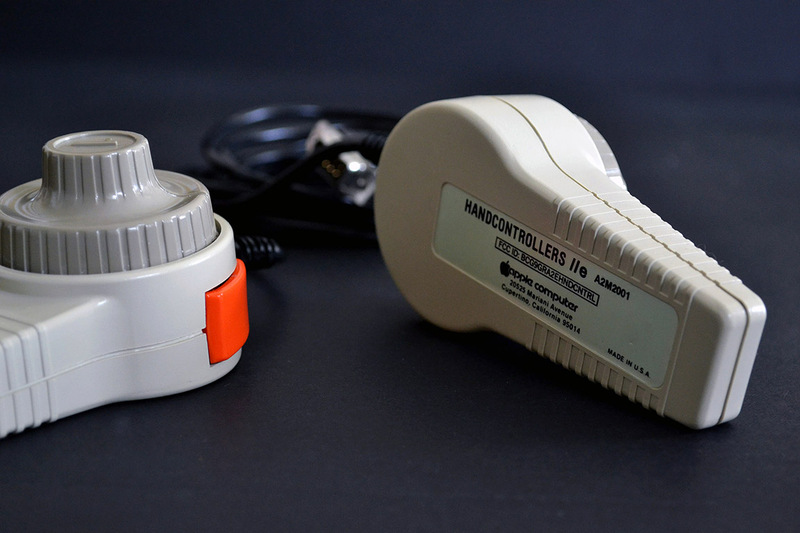 The controller card connected to slot 6 or 7. When I first started the computer, it made loud noises. these were the internal fan and the hard drive, both sounding like an airplane engine. After a few tests realized the drive was dead. I continue using the computer until the power supply started to make some noises. The power supply was starting to fail. I thought about selling the whole thing, but after a few days listed on eBay realized not everybody was interested in failing Vulcan, and would get very little for such a nice piece of history. Decided to fix it and keep it, by replacing with modern options. Why? Just because I don’t want to struggle with old SCSI drives, noisy power supplies that could fail again. My options were simple: new hard drive and power supply. The PSU was easy, as I already have a Reactive Micro PSU Kit. After several searches found a CF to IDE adapter, and a guy from eBay sold a kit that included an SD card formatted, the adapter and a ROM (v2.0) for the AE Vulcan card. 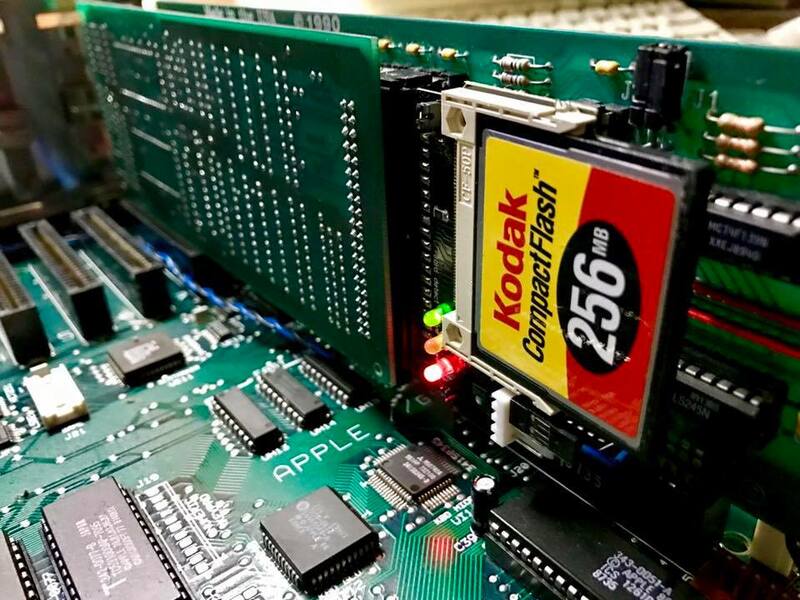 Fortunately my ROM was already version 2, so just had to connect the adapter and CF (it uses 5V for the adapter) card for it to get recognized. After that was a piece of cake to install the latest OS. 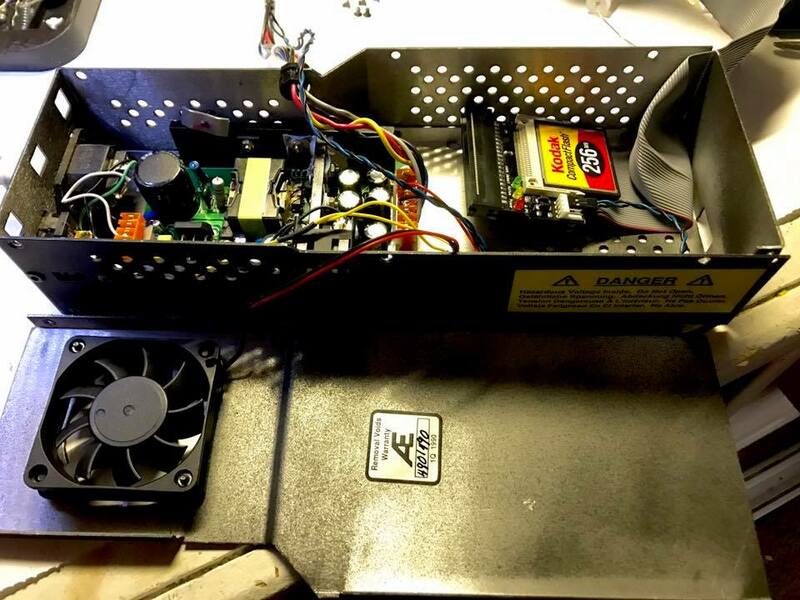 After the PSU and HD replacement, wanted to keep things like original, so added a cabler adapter and installed the CF adapter inside theVulcan power supply enclosure, which has lots of space now. Finally I replaced the internal fan with a silent one, as I hate noise. added a small switch to turn it on and off, as it’s really not needed with both PSU and CF being so efficient. 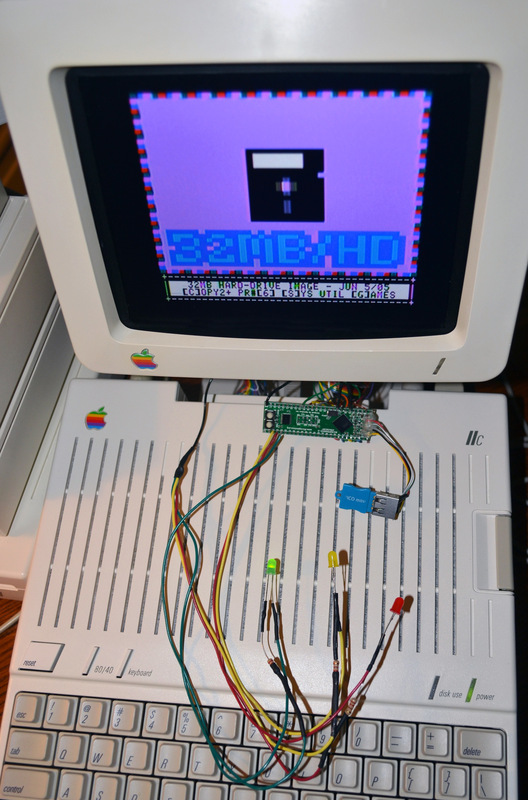 The result is a nice, fast replacement that kept all the good looks, but guarantees no failures or issues, and gives my IIgs a great advantage by allowing me to add more peripherals without worrying on PSU capacity. Last week in the city of Kansas, Missouri in the United States week took place the Festival Apple II: Kansasfest, an annual conference that has been held for the past 28 years. 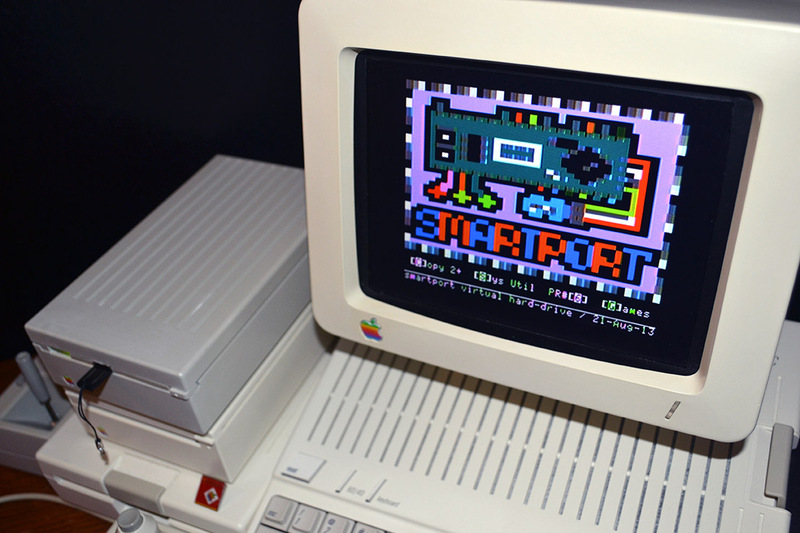 In recent years the competition has grown, many motivated by nostalgia for computers that marked the childhood of many of them. People walk through the halls carrying large and yellowed Apple IIs, peripherals, monitors and cards of all kinds. 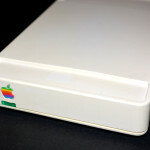 The purpose of the conference other than sharing the love for the first personal computers created by Steve Wozniak and Steve Jobs, is the present home creations, modifications and innovations for the platform. But the most exciting and anticipated of the conference, it is the famous “Garage Giveaway” (donation garage) where one of the beloved and dear organizers – Sean Fahey, donates a lot of computers and peripherals met for years obtained from different collectors and enthusiasts. In recent years, the old platform has received much attention from enthusiasts, because these first computers do not appear to be affected by the “controlled obsolescence” suffered by modern equipment. One of the benefits of these computers is that they are built like tanks, parts resist abuse and when they fail, they are easy to replace. One of the attendees presented a IIe he found buried in a garden, just sticking a corner. After cleaning hard, it worked smoothly. The conference is held for five days at the premises of the University of Rockhurst. The atmosphere is comfortable, great camaraderie and participants become university for a few days. Usually doors are always open allowing participants to share programming activities, talking or working on an experiment to present or help a comrade. In presentations you can find “hacks” or changes to all types of electronics, from emulators floppy disk in SD memories, conversions Power Supplies to new technologies, adaptations of CRT (tube Catholic rays, the old monitors glass) LCD, adaptations to connect these systems to the Internet, and more. There are also many new products and innovations in programming. This is because these systems were specifically created to be easily programmed by the same Steve Wozniak. New games, variants of programming and innovative applications are submitted by users participating in festivals programming. small groups who help and cooperate to create funny or functional applications, exchange stories, impressions and help each other in any form problem. The competition is not just local: visitors from Japan, France, Switzerland, Australia and Canada traveling specifically to attend and participate. It is very common to see how big boxes packed with computers that travel thousands of kilometers to a new home. In recent years, participation has increased in part due to the social networks that have helped spread the event. People who come for the first time usually return the next year thanks to the enthusiasm, camaraderie and good organization of the same. 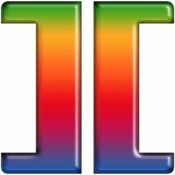 It is worth mentioning that the passion for the Apple II unites this diverse group of participants regardless of race, religion, sexuality or political affiliation. Finally, it is admirable how a technology of the past unites individuals in the present to improve the future of the platform. It’s been two years since I put together my Hackint0sh. Since then, it has been my daily workhorse running OSX Lion all this time. Since updating a Hackint0sh can get complicated, I opted to stay on lion, as I had experienced no problems… until now. I was working last Saturday converting a video, listening to music, browsing the web and Retouching with Photoshop (the computer can handle several tasks and I do it all the time). Suddenly, the “Finder” got stuck on the “beach ball”, but Pandora was still streaming music and I could navigate the web. After a few minutes i decided to restart the machine. I was surprised to get after the restart a text message: “Searching for Operating System…” I was not amused, and after several restarts and unplugs I removed the hard drive, an OCZ Vertex 3, that I bought a little more than a year ago. I spend some time trying to mount it on my Laptop, Mini and at the end even through Parallels, with no avail. It was completely dead. Looking online for solutions, I found out that a lot of people is havint trouble with OCZ. I had a good opinion of the brand, as my first SSD is an OCZ, in fact it’s being going strong for four years on my daughter’s laptop. I had to calm my ire and take it on a positive way: now the SSD drives are cheaper and proven, so after a few reviews found out Intel and Samsung are more reliable, with Crucial, Kingston and OCZ as the ones giving most problems. I went to the store and bought a Samsung (they were out of Intels) SATA III which is pretty fast. I restrain myself of buying a bigger drive, as 120 is enough for the system and applications. Thanks to past experiences and techie friends’ advice I have learned to use two hard drives (when hardware permits), a fast one for the OS and applications, and a bigger for data. This way and using an SSD the computer will start faster, load programs faster and keep important information separated. At the same time I have get used to backup my data, in different media, the main one being my home server. 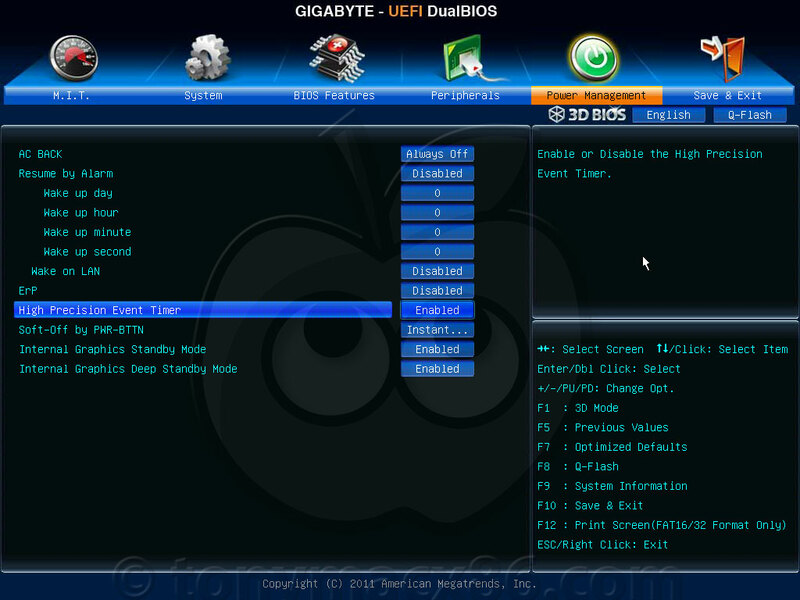 This time although, I will take the opportunity to update both the system and the motherboard BIOS. I found out there’s a new UEFI (Unified Extensible Firmware Interface) firmware update that adds new options and optimization to my system. This is the kind of things I did my research before buying the hardware, to be able to update and extend my hardware over time and stay up to date. After following tonymacx86.com guide, I updated the BIOS in a very fast an easy way. It goes away from the old text and crummy graphics bringing a nice, modern interface with new optimized options. After modifying the options to work with OSX, I started to install Mavericks following the UniBeast and MultiBeast processes. I have to confess this sis not for the faint of heart: I had to reinstall at least three times since I didn’t remember how I did it two years ago, and got some “Kernel Panics”, you have to be patient and careful. 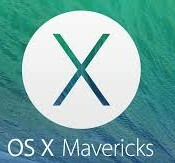 Finally I have a stable working Mavericks system with two monitors, perfect resolution, audio and networking without issues.I will take the opportunity and install my preferences to updated versions of Adobe, Apple Mozilla and other applications that use daily. 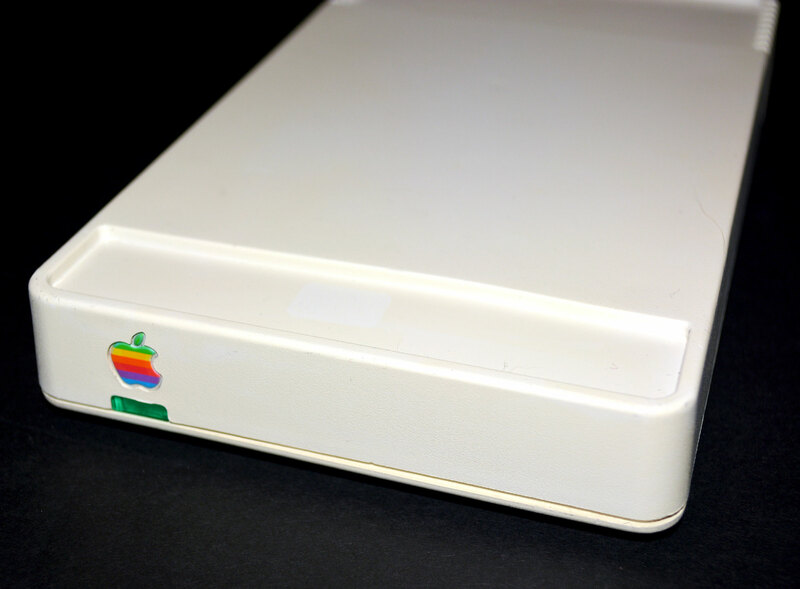 In the mid 80’s Apple came out with the Apple Modem 1200,a branded modem that came in beige and white colors. 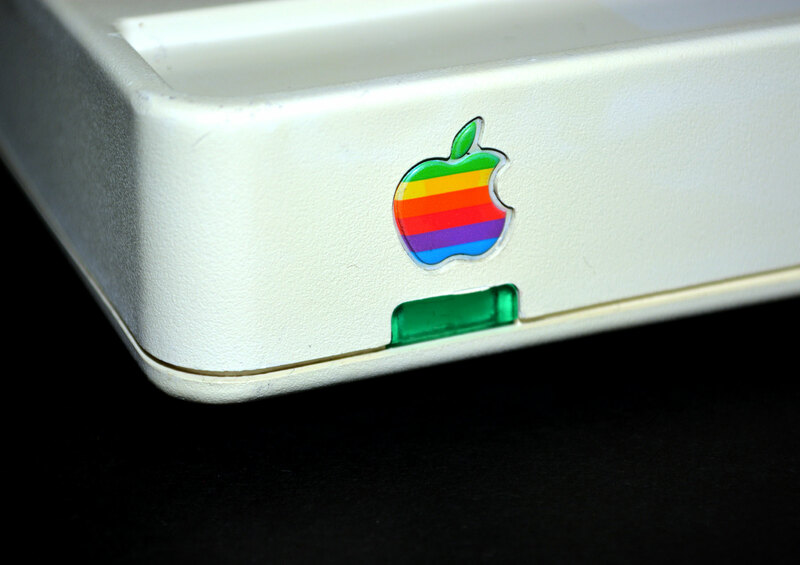 This last one was considered part of the Apple//c peripherals, as it appeared in the ads, later replaced by the platinum Apple personal Modem 300/1200. It is a hard to find item, finally foud one at a sensible price and got it. A few days later another appeared, and after nobody bid on it, I got it at the base price. Nice! I got two modems already cleaned and looking pristine, now I may have too many modems, what to do with them? 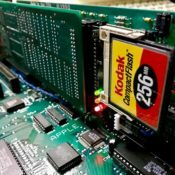 When I started programming computers, first Basic on the TI-99/4A, and soon assembler on the Apple //c, there were few options to learn it, more in a spanish speaking country. 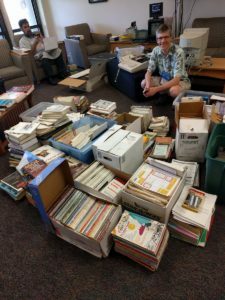 Other than an specific book, hard to obtain in those times, my only option were computer magazines where I learned by copying the program listings they published every month. they were short programs printed line by line and explained briefly. This will force you to avoid typos and to write fast. 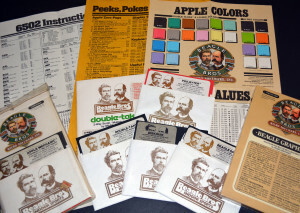 Later i discovered the “Beagle Brothers” programs, a different software company that didn’t copy-protected their disks, and encourage users in a fun way to discover and learn code, and programming tricks. The best for me were the posters full of useful and important information. After that I always tried to buy their programs with my teenage savings, as much as I could. 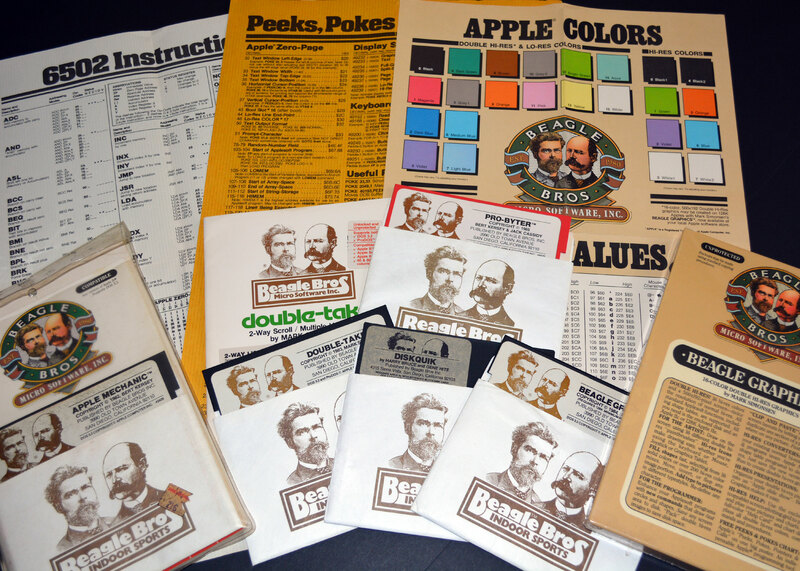 Over the years I made a good collection of their products, from which I only kept three: Beagle Graphics, Disk Quick & Utility City. Now I have been getting more of them little by little and will try to get the full collection. We will see. 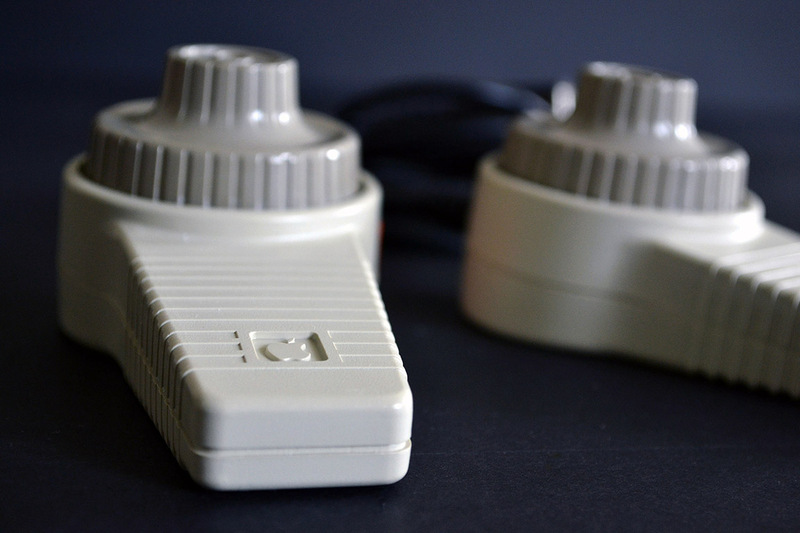 When I was a kid my dad brought back from one of his trips the first electronic game that I can remember: “Pong” this was a “console” that connected to the TV set and using a couple of paddles allowed you to control the virtual tennis racquets in one axis. 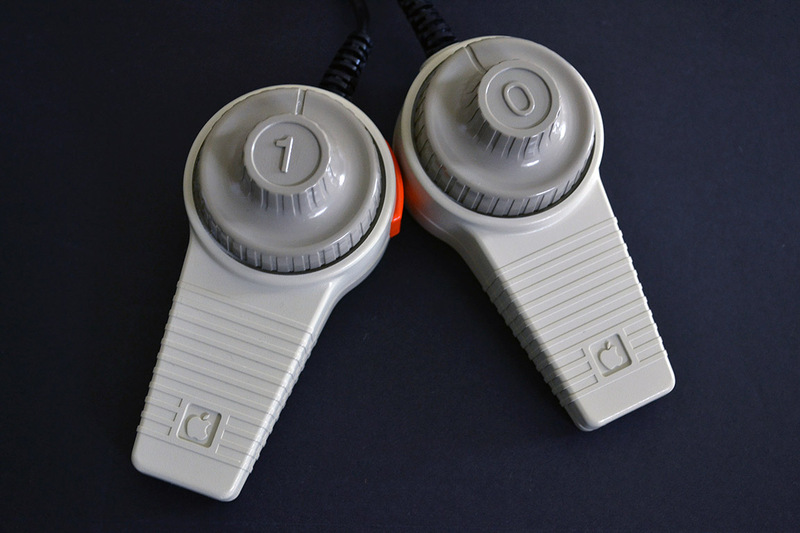 Well, many years later Apple came out with a version of those paddles, called Hand Controllers. 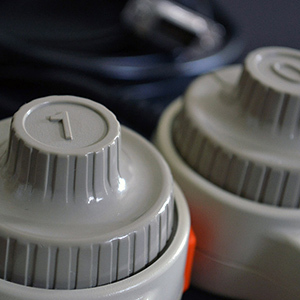 They were never popular, as there was not many games that took advantage of them, and the Joystick took over. I’ve been wanting to get a hold of this item for some time, but the prices are always exorbitant. Finally I found the paddles in good shape and reasonable price. 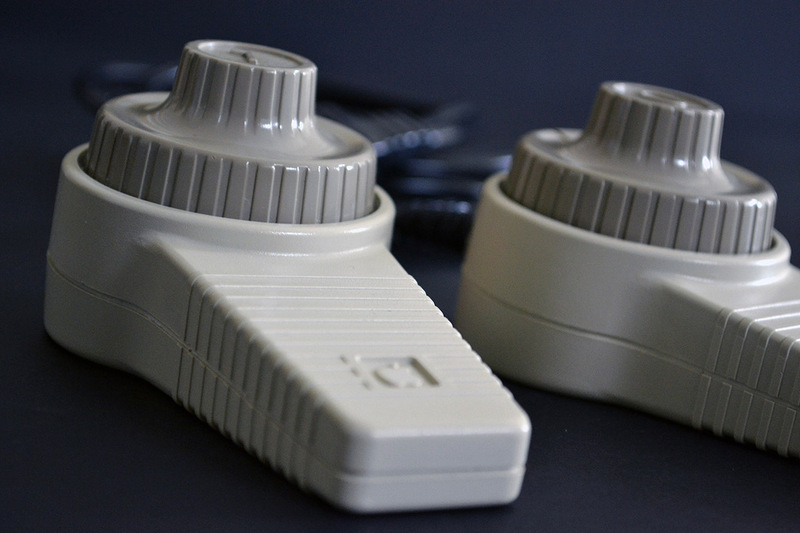 That of course implied the good old Retrobrite process and thoughtful cleaning. I think overall it was a great addition to my collection, and already have used them to play one of my favorite games – Wavy Navy – They work perfectly with this game. I’m really thankful to the author, and want to share it with my three readers. Juan lopez on Segunda Hackintosh: proyecto "FrankenMac"